Trinity Hall (formally The College or Hall of the Holy Trinity in the University of Cambridge) is a constituent college of the University of Cambridge, England. It is the fifth-oldest college of the university, having been founded in 1350 by William Bateman, Bishop of Norwich. Historically, Trinity Hall was known for teaching Law; today, it teaches the sciences, arts and humanities. Notable alumni include theoretical physicists Stephen Hawking and Nobel Prize winner David Thouless, Australian Prime Minister Stanley Bruce, Canadian Governor General David Johnston, philosopher Marshall McLuhan, and Charles Howard, 1st Earl of Nottingham. The devastation caused by the Black Death plague of the 1340s included the loss of nearly half of the English population; Bishop Bateman himself lost nearly 700 of his parish priests, and so his decision to found a college was probably centred on a need to rebuild the priesthood. The site that Bateman chose was the original site of Gonville Hall, which had been founded three years earlier, but was financially struggling. Bateman's clerical aim for the Hall is reflected in the foundation of 1350, when he stated that the college's aim was "the promotion of divine worship and of canon and civil science and direction of the commonwealth and especially of our church and diocese of Norwich." This led the college to be particularly strong in legal studies, a tradition that has continued over the centuries. 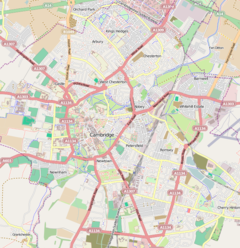 At first all colleges in Cambridge were known as 'Halls' or 'Houses' and then later changed their names from 'Hall' to 'College'. However, when Henry VIII founded Trinity College, Cambridge next door, it became clear that Trinity Hall would continue being known as a Hall. The new foundation's name may have been a punishment for the college's master, Stephen Gardiner, who had opposed the king's remarriage and had endured much of the college's land being removed. It is incorrect to call it Trinity Hall College, although Trinity Hall college (lower case) is, strictly speaking, accurate. A similar situation had existed once before when Henry VI founded King's College (in 1441) despite the existence of King's Hall (founded in 1317). King's Hall was later incorporated in the foundation of Trinity College in 1546. Trinity Hall, in addition to having a chapel, also had joint usage of the Church of St John Zacharias with Clare Hall, until the church was demolished to enable the construction of King's in the 15th century. After this, the college was granted usage of the nearby Church of St Edward, King and Martyr on Peas Hill, a connection which remains to this day. The college site on the River Cam was originally obtained from Bateman's purchase of a house from John de Crauden, Prior of Ely, to house the monks during their study, with Front Court being built within the college's first few decades. The chapel was licensed in 1352 and was built by August 1366, when Pope Urban V granted the Master and Fellows permission to celebrate Mass in the college. In 1729-1730, Sir Nathaniel Lloyd, the then college master, redecorated the chapel in what, despite subsequent enlargements, remains an intimate style, forming the smallest of the University's chapels. Lloyd removed some of the more prominent graves to the ante-chapel, while digging a vault for his own burial, and decorated the interior walls with wainscoting and the ceiling with stucco representations of past masters' crests. The chapel was extended to the east by a few feet in 1864, during which the medieval piscina was rediscovered and rendered accessible by a small door in the wainscoting. The current chapel painting is Maso da San Friano's Salutation, depicting Mary's visit to Elizabeth, from the opening of the Gospel of Luke, which replaced an earlier painting by Giacomo Stella in 1957. Like the chapel, the college's dining hall was rebuilt by Sir Nathaniel Lloyd along similar lines, with the panelling replaced throughout and the medieval beams replaced by fine baroque carvings. Although the hall was enlarged in the 19th century, it is still one of the smallest and most intimate dining halls in the University. The college library was built in the late 16th century, with the permission of Elizabeth I and probably during the mastership of Thomas Preston, and is now principally used for the storage of the college's manuscripts and rare books; it is one of the few remaining chained libraries left in the country. The new Jerwood Library overlooking the river was opened by Lord Howe in 1999, and stores the college's modern book collection. 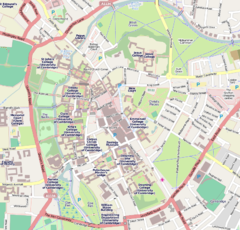 The college also owns properties in the centre of Cambridge, on Bateman Street and Thompson's Lane, and on its Wychfield site next to Fitzwilliam College, where most of the college's sporting activity takes place. Trinity Hall has active Junior, Middle and Senior Combination Rooms for undergraduate, postgraduate and senior members of the college community respectively. The Middle Combination Room is located in Front Court, while the Junior Combination Room is adjacent to the college bar in North Court. Both the MCR and JCR have highly active committees and organize popular socials for their members across the term. Trinity Hall's oldest and largest society, the Boat Club was founded in 1827, and has had a long and distinguished history; notably from 1890 until 1898, when the college stayed Head of the Mays for 33 consecutive days of rowing, which remains to this day the longest continuous defence by a single club of the bumps headship. The college won all but one of the events in the 1887 Henley Royal Regatta, making it the most successful Cambridge college in Henley's history. The current boathouse, built in 1905 in memory of Henry Latham, is on the River Cam, a short walk from the college. The current Master is the Revd. Jeremy Morris. He took up the role on 1 October 2014 after Martin Daunton stepped down after ten years in post. The current Dean is the Revd. Dr. Stephen Plant. The role of Dean also incorporates that of Chaplain in other colleges. David Johnston, Governor General of Canada. Arthur Henderson, Baron Rowley - Labour politician; Secretary of State for Air, 1947-51. ^ Arms of Trinity Hall, Cambridge, being the arms of Bateman, as used by William Bateman (d.1355), Bishop of Norwich 1344-55, founder of Trinity Hall: as seen (with bordure engrailed) at Trinity Hall, Cambridge (over B staircase), impaled by the arms of the See of Norwich. ^ a b "Student numbers" (PDF). University of Cambridge website. Archived from the original (PDF) on May 20, 2015. Retrieved 2009-10-11. ^ "Accounts for the year ended 30 June 2017" (PDF). Trinity Hall, Cambridge. Retrieved 3 August 2018. ^ "Trinity Hall -". cam.ac.uk. ^ "Trinity Hall - Master". Trinity Hall Cambridge. Retrieved 18 April 2014. Trinity Hall or, The college of scholars of the Holy Trinity of Norwich, in the University of Cambridge, Henry Elliot Malden. (1902). London: F.E. Robinson. Wikimedia Commons has media related to Trinity Hall, Cambridge.